For all the innovation that PC hardware’s enjoyed in recent times, power supplies have largely been left on the outside looking in. I mean, they’re pretty basic, right? Get one with enough juice that’s as efficient as you can afford, plug everything in, and you’re good to go. But at CES in Las Vegas, Thermaltake and Deepcool showed there are still new frontiers to be mined in power supplies. 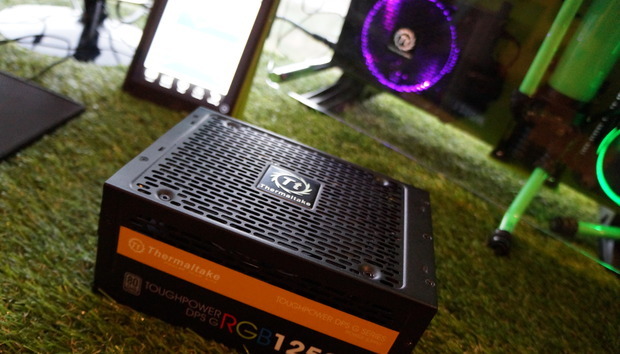 First up: Thermaltake’s Toughpower DPS G RGB 1250W, which as the name implies is a 1250W power supply with—get this!—a customizable ring of RGB lights atop the unit’s 140mm fan. (You can see it pictured above, both on a table and with purple lighting in a system in the background.) This 80 PLUS Titanium certified power supply ships with software that lets you choose the hue of the lights, or set them to a “Colorful” mode that shimmers from color to color. You can see the Toughpower DPS G RGB 1250W pictured in the lower-left corner of this wall-mounted PC. But it’s the other software that’s almost more intriguing. The PSU features Thermaltake’s Smart Power Management platform, which tracks your system’s power use to provide you with granular data built over time. It monitors power consumption, voltage distribution, and electricity costs, as well as the last six hours of activity, so you can see just how much your usage habits can affect your power use. All the data’s stored on Thermaltake servers so you can access it via your desktop or the company’s DPS G mobile app, which will even warn you in real-time if your power supply overheats or its fan fails. Thermaltake's DPS G software, both as a desktop program and a mobile app. To be fair, the Smart Power Management platform isn’t unique to the Toughpower DPS G RGB 1250W—you can find it on any Thermaltake PSU labeled with the “DPS” moniker. But between that, the 80 PLUS Titanium rating, and the customizable RGB lighting, this power supply sure stands out in a sea of all-too-similar solutions. Look for it to launch on January 22 for $380. You can find more detailed tech specs on its Newegg preorder page. Speaking of standing out, Deepcool was also at CES showing off a 650W liquid-cooled Gamer Storm Liquid-Cooling PSU. Yes, you read that correctly—a liquid-cooled PSU. Deepcool's liquid-cooled GamerStorm power supply. Sadly, we weren’t able to check out this silent monstrosity firsthand, but Legit Reviews (which snapped the picture above) checked it out and, well, found that the water-cooling was mostly for show rather than fixing any actual issues, though it obviously reduces fan noise. But hey—liquid-cooling for liquid-cooling’s sake has led to some amazingly exotic PC creations and we're deeply in favor of cranking things to 11 just because you can. If the idea of electrical equipment with water flowing through its veins doesn’t give you the heebie-jeebies, hit up Legit Reviews for more pictures and full details about the Deepcool Gamer Storm Liquid-Cooling prototype PSU.